The view the post for Christmas, click here. Central idea: The Virtues of the Children in God’s Family. Doctrine: Family Virtues. Practical Application: How to Teach Virtues to Children. To view the Lectionary 17 readings, click here. We children, whether young or old, can preserve ourselves from sinning and atone for the sins we do commit by honoring our fathers and mothers. But an even better reason to honor our fathers and mothers is because it is the order God has placed in human nature based in love. Out of love, they brought us into the world. Out of love, they cared for us when we were helpless. Out of love, they taught us the faith. Out of love, they have always done the best they could. We child who appreciates this and live accordingly will have a much happier life. Parents, however, make mistakes and sin. We don’t turn the tables on them and take revenge. Besides being wrong in itself, the revenge will turn back on us and we will receive harm. This psalm describes the blessings God ordinarily gives to the family that is in a right relationship with him. The blessings are described from the father’s perspective. To ‘fear the Lord’ or ‘walk in his ways’ means to cooperate with God’s grace to be child of God who never wants to offend his perfectly good and loving Father. The requirement of being a good father, then, is first being a good son of God the Father. The blessings are fruitful work, a fruitful wife, and many healthy children. And, from the sum total of many families, “the prosperity of Jerusalem,” or a fruitful society. 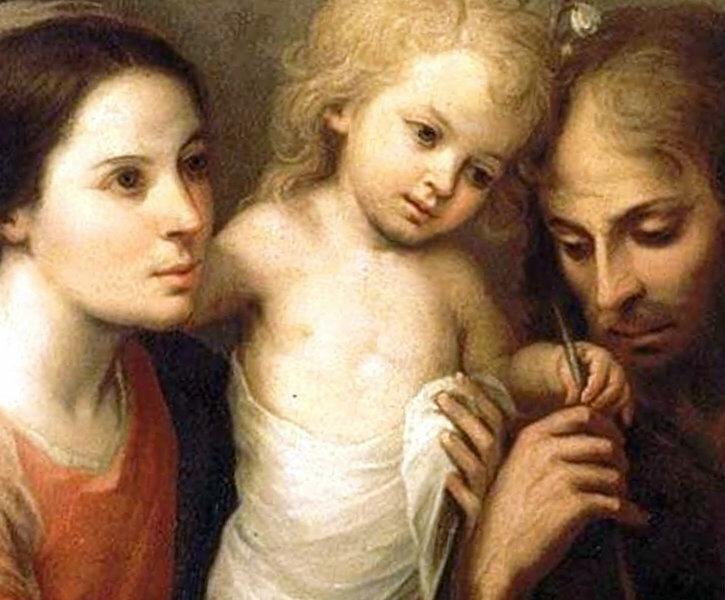 St. Paul comments on three virtues for the family. Within the mutual submission of God’s children—“Be subject to one another out of reverence for Christ” (Eph 5:21)—Paul reminds the husband to love, the wife to submit, and the children to obey. But before this, St. Paul sets out the cornucopia of virtues everyone in the family should learn and practice: Compassion, kindness, humility, gentleness, patience, forbearance, forgiveness, love, peace, thankfulness, religious practice and instruction, and love for God. In this environment it is not hard to love, submit, and obey. Joseph is “a just man” (Mt 1:19), which means he gives everyone, beginning with God and then those closest to him, what he owes them. This justice or responsibility is governed by his supernatural prudence, that is, his grace-inspired sound decision-making. While a Catholic father today usually exercises prudence by consulting the teachings of the Church for all religious and moral matters and right reason for all practical ones, Joseph’s council came from dreams in which God instructed him through angelic messages. Later his prudence was shown in courage. Courage is not always acting despite fear. Sometimes courage means taking a healthy fear into account by not being reckless. Joseph knew it would be foolhardy to return to Judah where another tyrant ruled. Through his virtuous obedience to God’s will, Joseph also fulfilled messianic prophecies. Just as God’s son, the nation of Israel, fled to Egypt to escape the death of famine and then was called back out if Egypt to the Promised Land of Israel, Jesus, too, fled to Egypt to escape murder and later was called back to Israel. And so, it came true that “Out of Egypt I called my son.” While this prophecy properly refers to Christ, it is also a compliment to Joseph. God the Father is calling Joseph his son, too. If our family is to be a holy family, all the members should practice all the virtues, assisted by grace. So the virtues these readings present are for everyone. Sirach points out the virtue of giving honor, which includes reverence, obedience, and care. The Psalmist praises the virtue of fear of the Lord. St. Paul extols the virtues of compassion, kindness, humility, gentleness, patience, forbearance, forgiveness, love of neighbor, peace, thankfulness, religion, and love of God. Matthew credits Joseph with the virtues of prudence, courage, and obedience. In the family, one’s role, age, and situation indicate how one exercises these virtues. Each family member who is of sufficient maturity can focus on the virtues that seem most necessary. For example, a husband without children, a husband with children, and a husband with aged parents and grown children might probably need some virtues more than others. Parents can teach virtues to their children in three ways. The first way is by example. Children model themselves on their parents’ behavior. This way is the easiest for children because they are natural imitators. It is the hardest for parents, because parents must live the virtues they are to be examples of. The second way is by training. You give children tasks, show them how to do them, coach them through them, and then repeat this process until habits are formed. A practical problem here is that when children are most eager to do whatever tasks their parents tell them, they are least capable of doing anything, and when they are quite capable of doing tasks their parents want, they least want to do them! So, the prime years for giving guided practice in the home are probably between six and twelve, because children can do things and are still eager to do them. The third way is word or instruction. This is the last and least effective method of teaching virtues to children, because the instruction can easily go in one ear and out the other. Long lectures on what responsibility is and why it is important may have no effect. But making kids take the trash out every day after dinner, because it is their assigned responsibility which benefits the family, could be effective, since it combines word and practice. Is it absurd that we have gone from the virtues God extolls and that the Holy Family practiced to taking out the garbage? Not at all, since love, which is the highest virtue, is shown by concrete acts, the humbler the better. We are God’s children, so we should behave accordingly by living virtues. We have a model in the Holy Family of Jesus, Mary, and Joseph.